Wind turbine design and wind farm design for wind power generation, wind speed maps and wind forecast for wind electricity generation. As a general rule, wind generators are practical where the average wind speed is 10 mph (16 km/h or 4.5 m/s) or greater. Usually sites are pre-selected on basis of a wind atlas, and validated with wind measurements. Obviously, meteorology plays an important part in determining possible locations for wind parks, though it has great accuracy limitations. Meteorological wind data is not usually sufficient for accurate siting of a large wind power project. An 'ideal' location would have a near constant flow of non-turbulent wind throughout the year and would not suffer too many sudden powerful bursts of wind. An important turbine siting factor is access to local demand or transmission capacity. Map of available wind power over the United States. Color codes indicate wind power density class. 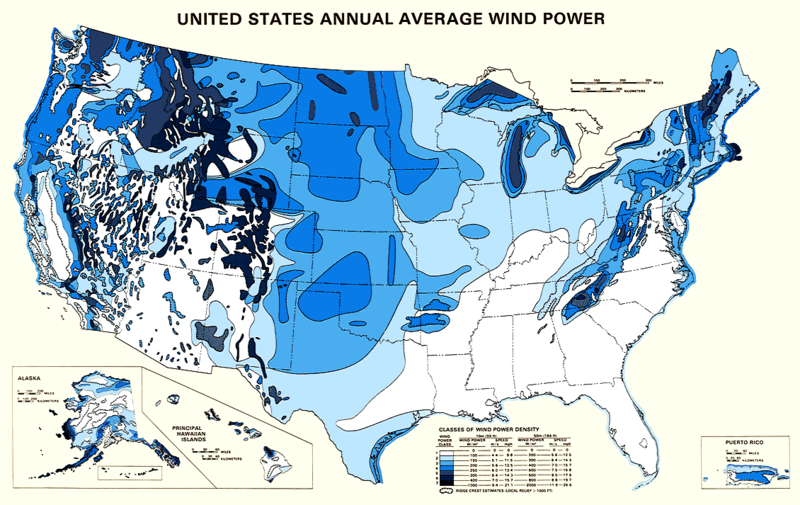 This map shows the wind resource in the United States. Land is categorized by wind power class (left column of key), defined by a range of annual average wind speeds measured at 10 meters (33 feet) and 50 meters (164 feet). The columns called Wind Power estimate how much potential energy from the wind (in watts) is available per square meter of land, assuming wind turbine hub height of 10 or 50 meters. (Of course, to calculate Wind Power, assumptions about turbine size and performance were made.) Wind turbines are economical in wind power class 4–7. The wind blows faster at higher altitudes because of the reduced influence of drag of the surface (sea or land) and the reduced viscosity of the air. The increase in velocity with altitude is most dramatic near the surface and is affected by topography, surface roughness, and upwind obstacles such as trees or buildings. Typically, the increase of wind speeds with increasing height follows a logarithmic profile that can be reasonably approximated by the wind profile power law, using an exponent of 1/7th, which predicts that wind speed rises proportionally to the seventh root of altitude. Doubling the altitude of a turbine, then, increases the expected wind speeds by 10% and the expected power by 34% (calculation: increase in power = (2.0) ^(3/7) – 1 = 34%). Wind farms or wind parks often have many turbines installed. Since each turbine extracts some of the energy of the wind, it is important to provide adequate spacing between turbines to avoid excess energy loss. Where land area is sufficient, turbines are spaced three to five rotor diameters apart perpendicular to the prevailing wind, and five to ten rotor diameters apart in the direction of the prevailing wind, to minimize efficiency loss. The "wind park effect" loss can be as low as 2% of the combined nameplate rating of the turbines. Utility-scale wind turbine generators have minimum temperature operating limits which restrict the application in areas that routinely experience temperatures less than −20°C. Wind turbines must be protected from ice accumulation, which can make anemometer readings inaccurate and which can cause high structure loads and damage. Some turbine manufacturers offer low-temperature packages at a few percent extra cost, which include internal heaters, different lubricants, and different alloys for structural elements, to make it possible to operate the turbines at lower temperatures. If the low-temperature interval is combined with a low-wind condition, the wind turbine will require station service power, equivalent to a few percent of its output rating, to maintain internal temperatures during the cold snap. For example, the St. Leon, Manitoba project has a total rating of 99 MW and is estimated to need up to 3 MW (around 3% of capacity) of station service power a few days a year for temperatures down to −30°C. This factor affects the economics of wind turbine operation in cold climates. Onshore turbine installations in hilly or mountainous regions tend to be on ridgelines generally three kilometers or more inland from the nearest shoreline. This is done to exploit the so-called topographic acceleration. The hill or ridge causes the wind to accelerate as it is forced over it. The additional wind speeds gained in this way make large differences to the amount of energy that is produced. Great attention must be paid to the exact positions of the turbines (a process known as micro-siting) because a difference of 30 m can sometimes mean a doubling in output. Local winds are often monitored for a year or more with anemometers and detailed wind maps constructed before wind generators are installed. For smaller installations where such data collection is too expensive or time consuming, the normal way of prospecting for wind-power sites is to directly look for trees or vegetation that are permanently "cast" or deformed by the prevailing winds. Another way is to use a wind-speed survey map, or historical data from a nearby meteorological station, although these methods are less reliable. Wind farm siting can sometimes be highly controversial, particularly as the hilltop, often coastal sites preferred are often picturesque and environmentally sensitive (for instance, having substantial bird life). Local residents in a number of potential sites have strongly opposed the installation of wind farms, and political support has resulted in the blocking of construction of some installations. Near-Shore turbine installations are generally considered to be inside a zone that is on land within three kilometers of a shoreline and on water within ten kilometers of land. Wind speeds in these zones share wind speed characteristics of both onshore wind and offshore wind depending on the prevailing wind direction. Common issues that are shared within Near-shore wind development zones are aviary (including bird migration and nesting), aquatic habitat, transportation (including shipping and boating) and visual aesthetics amongst several others. Sea shores also tend to be windy areas and good sites for turbine installation, because a primary source of wind is convection from the differential heating and cooling of land and sea over the course of day and night. Winds at sea level carry somewhat more energy than winds of the same speed in mountainous areas because the air at sea level is more dense. Near-shore wind farm siting can sometimes be highly controversial as coastal sites are often picturesque and environmentally sensitive (for instance, having substantial bird life). Local residents in a number of potential sites have strongly opposed the installation of wind farms due to visual aesthetic concerns. Offshore wind development zones are generally considered to be ten kilometers or more from land. Offshore wind turbines are less obtrusive than turbines on land, as their apparent size and noise can be mitigated by distance. Because water has less surface roughness than land (especially deeper water), the average wind speed is usually considerably higher over open water. Capacity factors (utilisation rates) are considerably higher than for onshore and near-shore locations which allows offshore turbines to use shorter towers, making them less visible. In stormy areas with extended shallow continental shelves (such as Denmark), turbines are practical to install — Denmark's wind generation provides about 18% of total electricity demand in the country, with many offshore windfarms. Denmark plans to increase wind energy's contribution to as much as half of its electrical supply. Locations have begun to be developed in the Great Lakes - with one project by Trillium Power approximately 20 km from shore and over 700 MW in size. Ontario is aggressively pursuing wind power development and has many onshore wind farms and several proposed near-shore locations but presently only one offshore development. In most cases offshore environment is more expensive than onshore. Offshore towers are generally taller than onshore towers once the submerged height is included, and offshore foundations are more difficult to build and more expensive. Power transmission from offshore turbines is generally through undersea cable, which is more expensive to install than cables on land, and may use high voltage direct current operation if significant distance is to be covered — which then requires yet more equipment. Offshore saltwater environments can also raise maintenance costs by corroding the towers, but fresh-water locations such as the Great Lakes do not. Repairs and maintenance are usually much more difficult, and generally more costly, than on onshore turbines. Offshore saltwater wind turbines are outfitted with extensive corrosion protection measures like coatings and cathodic protection, which may not be required in fresh water locations. While there is a significant market for small land-based windmills, offshore wind turbines have recently been and will probably continue to be the largest wind turbines in operation, because larger turbines allow for the spread of the high fixed costs involved in offshore operation over a greater quantity of generation, reducing the average cost. For similar reasons, offshore wind farms tend to be quite large—often involving over 100 turbines—as opposed to onshore wind farms which can operate competitively even with much smaller installations.